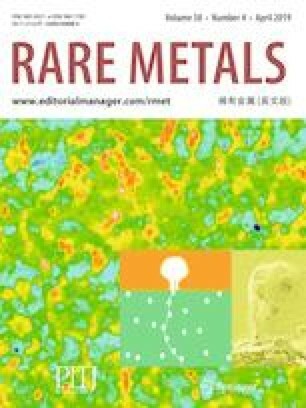 Er-doped Sm1−xErx(CobalFe0.15Cu0.08Zr0.03)7.8 (x = 0, 0.1, 0.2, 0.3) magnets with a low remanence temperature coefficient were prepared by powder metallurgy method. The influence of Er content on the remanence and microstructure was investigated. X-ray diffractometer (XRD) analysis showed that the magnets with different Er contents consist of 2:17R phase and 1:5H phase. Scanning electron microscopy (SEM) analysis showed that the composition of the matrix is consistent with stoichiometric composition and no obvious precipitated phase appears. With the increase in doped Er amount, the temperature stability of Sm1−xErx(CobalFe0.15Cu0.08Zr0.03)7.8 (x = 0, 0.1, 0.2, 0.3) is getting better. When x is up to 0.3, the magnets with a low remanence temperature coefficient are obtained and the remanence descends tardily from 0.86 to 0.80 T as the temperature rises from room temperature to 400 °C. These results indicate that Er substitution for Sm in SmCo-based permanent magnets together with optimal composition and proper heat treatment could achieve a desired magnetic performance combined with high thermal stability. This work was financially supported by the National Natural Science Foundation of China (Nos. 51761145026 and 51471016) and the Beijing Natural Science Foundation (No. 2151002).